(park at finish line for all distances). Shuttles will drive you to the start on top Ft. Mountain for half marathon, 10K and 5K (6:00am-7:50am). There is no parking at the start! Please note: 7:30 am start time for the Half, 7:50am for 10K and 8:05am for the 5K. 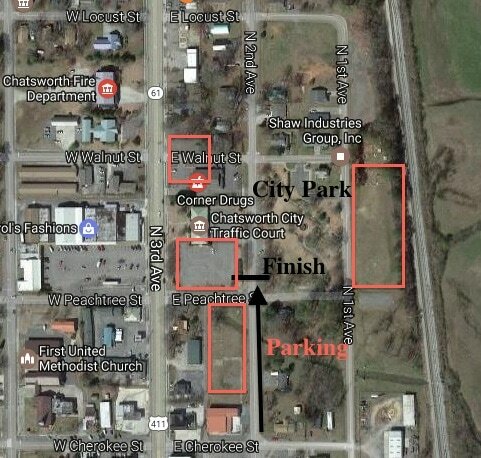 Parking around City Park- 401 N. 2nd Ave Chatsworth GA 30705. Plenty of parking in various parking lots. Runners for the Half can get dropped off at the start but your ride can’t head westbound down Hwy 52 after 7:15am. Half marathon starts 7:30am a top Fort Mountain (Overlook inn 9440 Hwy 52, Chatsworth). The 10K/5K start at various points along highway 52. We’ll have 5 buses making round trips from the City Park to Ft. Mnt starting at 6:00am. Once on top of Fort Mountain we start at a scenic overlook and across from the Overlook Inn, which has graciously offered to allow the first bus loads to wait in their breakfast building. There will be tables, chairs, coffee and water. Portable bathroom rooms will be across the street near the start. If you want to warm-up before the race use caution running on the roads. If you're staying on Fort Mountain or do not want to take a shuttle bus to the start then you can have someone drop you off at the Overlook Inn parking area. Make sure they leave well in advance of 7:30am or they will be behind runners the whole way down Hwy 52. We suggest getting dropped off by 7am if you choose to get your own ride.